Eawag’s Info Day is devoted once a year to a current research topic. The event is aimed at anyone who is interested in the subject, and particularly experts working in the field in focus. The core of the event consists of lectures by Eawag’s resident experts, supplemented with specific contributions from external speakers. The Eawag Info Day serves as a forum for knowledge exchange between academia and practitioners, allowing plenty of time for plenary discussions as well as informal conversations. Numerous reusable materials flow into wastewater from our households, industry and businesses to water-treatment plants. Wastewater can yield energy and fresh water use can be reduced by the utilization of treated grey water. As part of a recycling economy it is also desirable to recover nutrients that can be reutilized. 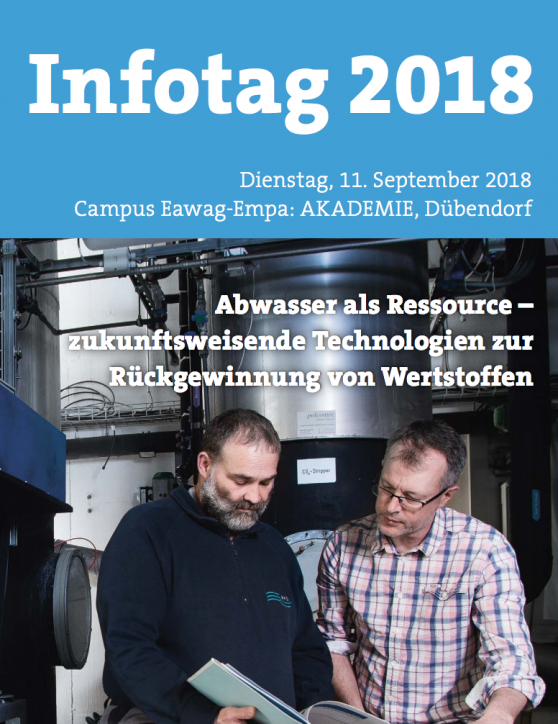 At this year’s Eawag Info Day, established and promising technologies for extracting and recycling energy and reusable materials from wastewater in water-treatment plants and households will be discussed. These processes will not only protect natural resources in the future, but also reduce negative effects on people and the environment. POWERSTEP partner Marc Böhler will present the nitrogen recovery by stripping technology. Please visit the event website for a detailed programme (in german) and registration.